I’m trying to figure out how to write a software oscilloscope audio visualization. It’s made more frustrating by the knowledge that I am certain that I have accomplished this task before. In this context, the oscilloscope is used to draw the time-domain samples of an audio wave form. I have written such a plugin as part of the xine project. However, for that project, I didn’t have to write the full playback pipeline– my plugin was just handed some PCM data and drew some graphical data in response. Now I’m trying to write the entire engine in a standalone program and I’m wondering how to get it just right. 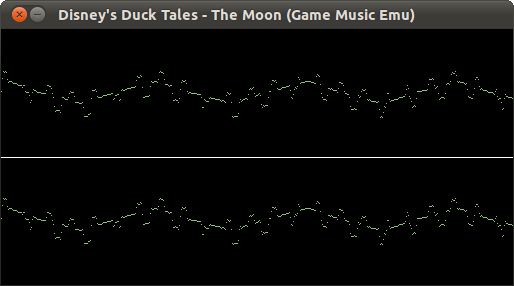 This is an SDL-based oscilloscope visualizer and audio player for Game Music Emu library. My approach is to have an audio buffer that holds a second of audio (44100 stereo 16-bit samples). The player updates the visualization at 30 frames per second. The o-scope is 512 pixels wide. So, at every 1/30th second interval, the player dips into the audio buffer at position ((frame_number % 30) * 44100 / 30) and takes the first 512 stereo frames for plotting on the graph. It seems to be working okay, I guess. The only problem is that the A/V sync seems to be slightly misaligned. I am just wondering if this is the correct approach. Perhaps the player should be performing some slightly more complicated calculation over those (44100/30) audio frames during each update in order to obtain a more accurate graph? I described my process to an electrical engineer friend of mine and he insisted that I needed to apply something called hysteresis to the output or I would never get accurate A/V sync in this scenario. Further, I know that some schools of thought on these matters require that the dots in those graphs be connected, that the scattered points simply won’t do. I guess it’s a stylistic choice. Still, I think I have a reasonable, workable approach here. I might just be starting the visualization 1/30th of a second too late. So, the projects are participating in the Google Summer of Code for the 2012 season. (While Libav is the project officially accepted to particular, I still refer to the projects because FFmpeg will also benefit). Wish them luck– these are some ambitious projects. I downloaded a multimedia file a long time ago (at least, I strongly suspected it was a multimedia file which is why I downloaded it). It went by the name of ‘lamborghini_850kbps.vg2’. I have had it in my collection for at least 7 years. I couldn’t remember where I found it. I downloaded it before it occurred to me to take notes about this sort of stuff. I found myself staring at the file again today and Googled the filename. This led me to a few Japanese sites which also contained working URLs for a few more .vg2 samples. Some other clues led me to a Russian language forum where someone had linked to a site that had Win32 codec modules that could process the files. The site was defunct but the Internet Archive Wayback Machine kept a copy for me, as well as copies of several more .vg2 samples from a defunct Japanese site previously involved with this codec. Sometimes this internet technology works really well. But I digress. Anyway, through all this, I finally found a clue: XVD. and wouldn’t you know, there is already a basic page on the MultimediaWiki describing the technology. In fact, while VG2 is a custom container, the MultimediaWiki states that the video component has a FourCC of VGMV, and there is already a file named VGMV.avi in the root V-codecs/ samples directory, something I vow to correct (that’s a big pet peeve of mine– putting samples in the root V-codecs/ or A-codecs/ directories). If they say so. For my part, I’m just happy that I have finally figured out what this lamborghini_850kbps.vg2 is so that I can properly catalog it on the samples site, which I have now done, along with other samples and various codecs modules. This episode reminds me that there’s a branch office of Zygo Corporation close to my home (though the headquarters are far, far away). 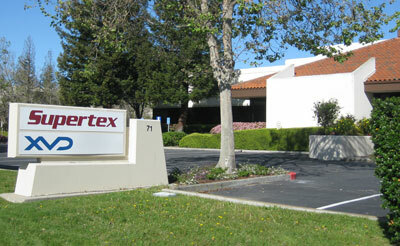 The companies you see in Silicon Valley. Anyway, long-time open source multimedia hackers will no doubt recognize Zygo from the ZyGo FourCC & video codec transported in QuickTime files that was almost decode-able using an H.263 decoder. I may never learn what Zygo’s core competency actually is, but I will always remember their multimedia tech every time I run past their office. I have been looking at the RoQ file format almost as long as I have been doing practical multimedia hacking. 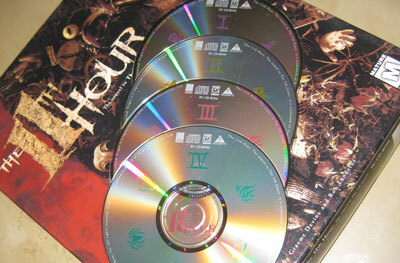 However, I have never figured out how the RoQ format works on The 11th Hour, which was the game for which the RoQ format was initially developed. When I procured the game years ago, I remember finding what appeared to be RoQ files and shoving them through the open source decoders but not getting the right images out. I decided to dust off that old copy of The 11th Hour and have another go at it. The game consists of 4 CD-ROMs. Each disc has a media/ directory that has a series of files bearing the extension .gjd, likely the initials of one Graeme J. Devine. These are resource files which are merely headerless concatenations of other files. Thus, at first glance, one file might appear to be a single RoQ file. So that’s the source of some of the difficulty: Sending an apparent RoQ .gjd file through a RoQ player will often cause the program to complain when it encounters the header of another RoQ file. I have uploaded some samples to the usual place. However, even the frames that a player can decode (before encountering a file boundary within the resource file) look wrong. I wrote dreamroq last year– an independent RoQ playback library targeted towards embedded systems. I aimed it at a gjd file and quickly hit a codebook error. RoQ is a vector quantizer video codec that maintains a codebook of 256 2×2 pixel vectors. In the Quake III and later RoQ files, these are transported using a YUV 4:2:0 colorspace– 4 Y samples, a U sample, and a V sample to represent 4 pixels. This totals 6 bytes per vector. A RoQ codebook chunk contains a field that indicates the number of 2×2 vectors as well as the number of 4×4 vectors. The latter vectors are each comprised of 4 2×2 vectors. Thus, the total size of a codebook chunk ought to be (# of 2×2 vectors) * 6 + (# of 4×4 vectors) * 4. However, this is not the case with The 11th Hour RoQ files. Juggling the numbers for a few of the codebook chunks, I empirically determined that the 2×2 vectors are represented by 10 bytes instead of 6. Now I need to determine what exactly these 10 bytes represent. I should note that I suspect that everything else about these files lines up with successive generations of the format. For example if a file has 640×320 resolution, that amounts to 40×20 macroblocks. dreamroq iterates through 40×20 8×8 blocks and precisely exhausts the VQ bitstream. So that all looks valid. I’m just puzzled on the codebook format.